After last week’s surprisingly stacked lineup of fast swims, we have yet another heap of intense and exciting action around the Big 12 ahead of us. Texas downed SEC powerhouses Auburn and Georgia on the road last week while Iowa State trampled over Omaha and Northern Iowa. Also of note last week was WVU’s final home meet in their historic WVU Natatorium. The Mountaineers ended up handily defeating TCU, drawing a spectacularly large crowd in the process. For a complete preview of this weekend’s action, check below. The University of Texas Longhorns will host their annual long course invitational this week, starting Thursday morning. The meet is scheduled to be run in reverse NCAA order, starting with the long course versions of day three’s events (1500 free, 100 free, 200 breast, 200 fly, 200 back) contested on day one of competition. In attendance this weekend will be of range of college-aged Texas Longhorns, Texas A&M Aggies and DU Hilltoppers mixed with some of the nation’s most competitive 18&U’s. On the psych sheet, national-teamers Will Licon, Clark Smith, Bethany Galat and Madyison Cox are all slated for fast swims in their main events. Licon and Galat will look to dominate their breaststroke races while Smith should give fellow Texas grad Townley Haas a decent challenge in the mid-distance free races. On the women’s side Canadian Olympian Sydney Pickrem leads the lady Aggies in the 200 back, 200 breast and 400 IM this weekend, which should push Longhorns Cox and Claire Adams to fasters swims. To see an estimated timeline of the Longhorn’s long course invite, click here. After hosting their final dual meet in the WVU Natatorium (while construction on the new facility wraps up) the West Virginia University Mountaineers will travel to Penn State to take on the Lions in University Park. The Mountaineers will rely heavily on their large fleet of seniors with Jake Armstrong, Drew Damich, Tristen Di Sibio, Merwane El Merini and Jake Preaskorn a part of that fleet. Last weekend, the Mountaineer men won 15 of 16 events to beat the Horned Frogs, 233-64, while the women won all 16 events and claimed a 208-92 victory. The men are now 4-1 heading into their battle with the Lions this weekend while the women currently rest at 3-2. Despite the massive victory for both the men and women over TCU last weekend, only the men will be traveling to Penn State which gives the women a week off before taking on Big 12 rival Iowa State. The Mountaineers will look to a young diving crew to help out with scoring points against the Lions. Freshman Nick Cover is expected to repeat his 3-meter performance from last weekend, which earned him a victory over the Horned Frogs and a score of 315.75. 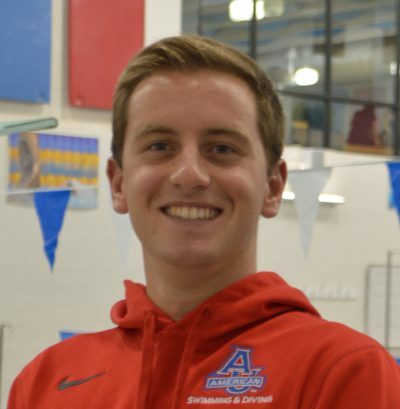 Winner of the 1-meter board last week, Redshirt freshman Jacob Cardinal Tremblay, will also be there to assist after scoring a 306.22. The usual suspects will be in attendance for the Mountaineers, which should break up some of Penn State’s potential victories in certain events. The struggle for the Lions will likely be rooted in their relatively shallow roster; Penn State just doesn’t have the depth that WVU has. The Lions do have a few standouts like Michael Daly (500 & 1650 free), Hayden Harlow (200 & 400 IM) and Matthew Dinuzio (100 & 200 fly) but still lack the depth needed to earn those second, third and fourth places finishes, which could end up costing much needed points. The Iowa State Cyclones are just coming off a whirlwind victory over Omaha (153-68) and Northern Iowa (179-121). The Cyclones will rely on their talented divers to lead the way in winning events with NCAA Zone qualifier Dana Liva coming in as the favorite on both boards, as she walked away from last weekend with wins in the 1-meter and 3-meter events. Liva’s teammate, Sydney Roland, earned the runner-up spot on both boards last week and will look to get past Liva this week. In the pool, the Cyclones are expecting the medley relay team of Emily Haan, Martha Haas, Elynn Tan and Evan Hundley to put up big points against the Cardinals after putting together a 1:44.25 in the event last weekend. Haan (57.10, 100 back) and Haas (1:05.67, 100 breast) each posted solid times in their respective strokes and will look to improve upon those performances against ISU. The Cyclones should have some luck in the sprint free events as well with Tan coming into the meet with a 23.92 in the splash n’ dash. Competition is expected to start at 5 p.m. Follow the team on Twitter (@CycloneSD) or on Facebook at facebook.com/cycloneSD for in-game updates. Check back over the weekend for a full recap of our Big 12 conference action.